There's an interesting story over at the Herald about China's government trying to block access to Second Life. It may be part of a larger campaign to protect youth from violence in gaming. China has, of course, blocked Twitter and YouTube for political reasons. 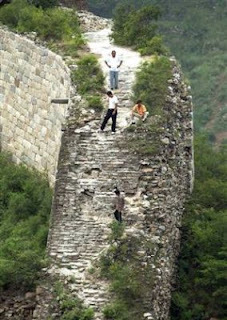 Yes, they've put up a wall that, in the long run, will crumble as surely as the Great Wall itself. I chuckle at China's efforts, even though were it the US government doing this, my blood would boil. I don't take well to being told what to do. Time for another revolution, folks. China's geriatric government is just postponing its Day of Doom. All those bright Chinese students who study abroad and the return know what lies beyond the Great Red Firewall. As much as I like the quotation attributed to him, I don't think Chairman Mao was correct when he said "It's always darkest just before it gets completely black." As bad as it looks for civil rights in China, it's just a matter of time before repressive governments like those in Beijing and Tehran are undermined by the very tools they provide workers and students to boost their economies. Both nations have good I.T. infrastructure and large numbers of educated young people. Old theocrats like Ayatollah Khamenei and old Chinese autocrats like those in China's Politburo will have to live with the results. A nice ray of hope in troubled times, that. And while the wall in China crumbles politicians in Germany pull up their sleeves to build just that wall here. And they are not only building that wall, no some of them are openly admiring the chinese way of handling it. Yet at the same time they miss an important thing. Censoring the access to malicious content won´t ban the content from the net. When there is something to be done ... fight the root of the problem. That woulnd´t make it necessary to lessen the personal freedom of the individual. I tell you, Tenchi, this-here Intertubes Net Thingie is bigger than the State. I hope it helps to topple the Iranian mullahs and their lackeys.